Alex Gitungano (left) and Leo Ikoribitangaza with Eve Alpern of Berklee College of Music. 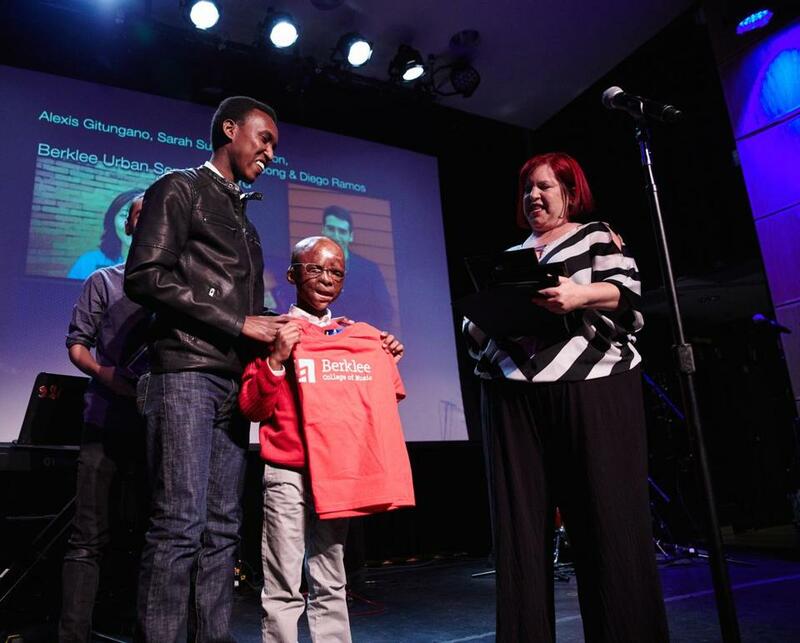 Berklee College of Music hosted its annual Berklee Urban Service Awards on Saturday. Among the honorees were Boston City Council president Michelle Wu, who was recognized for her legislative advocacy in support of Boston musicians, and Alex Gitungano, who was honored for his outstanding commitment to humanitarianism and his efforts to help a severely burned boy named Leo Ikoribitangaza. (Gitungano and Ikoribitangaza are originally from Burundi in East Africa, and Globe writer Scott Helman wrote about their journey in 2015). The awards ceremony also featured performances by the Berklee alumna Alicia Ortiz, the Charlestown High School select choir, and Jazz Urbane, a Berklee-based group established by the college’s Africana Studies leader, Bill Banfield. Other 2017 BUSA award recipients included Turahn Dorsey, Boston’s chief of education; Matt McArthur, the founder and executive director of The Record Co.; Michelle DeLew of Rosie’s Place; and Andrea Howard, CEO of West End House.